Towards the end of every year, we tend to see a few amazing credit card offers pop up as the banks try to take advantage of the wave of mass holiday spending that’s about to take place. Last year, it was the Scotiabank Gold American Express that had an unbelievable signup offer worth $350. This year, it’s the HSBC World Elite MasterCard, whose signup bonus of up to 105,000 HSBC Rewards points is well worth your attention. Buckle up for this one, because HSBC seems to have made their flagship year-end credit card offer as byzantine as possible. The first thing to note is that there are two separate offers: one for non-Quebec residents and one for Quebec residents. Approval for the card will be based on your credit file, so unfortunately no mail-forwarding shenanigans can be pulled. Both offers expire on December 31, 2018, and require a minimum personal annual income of $80,000, household income of $150,000, or assets of $400,000 at any Canadian financial institution to be eligible. Essentially, upon reaching spending thresholds of $1,000, $5,000, or $10,000 within the first 120 days, your cumulative signup bonus will become, respectively, 25,000, 50,000 or 75,000 HSBC Rewards points. We’ll talk more about how exactly the HSBC Rewards program works later on. 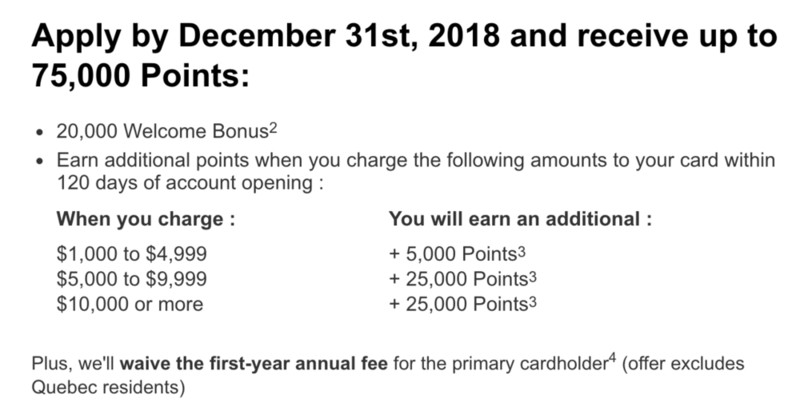 For now, if we use the most simple valuation of cashing out the points for a travel credit at a ratio of 200 HSBC Rewards points = $1, then we see that those bonuses would be worth $125, $250, or $375 in total. Consider the best-case scenario in which you achieve the maximum spending threshold of $10,000 in the first 120 days. You’ll have earned at least 105,000 HSBC Rewards points (potentially more if some of your spending was on travel, thus earning 6x instead of 3x), which is worth at least $525 in travel credits. Throw in the first-year fee waiver, and that is a spectacular intro offer for a fixed-points rewards card. Of course, the caveat is that you have to spend $10,000 within four months on the card in order to achieve the maximum signup bonus. That’s certainly a daunting amount of organic spending even in light of the holiday season being upon us, so you might have to get a little creative. You gotta do what you gotta do for a jaw-dropping $525 in free travel. This is a MasterCard, so you can make large bill payments for free via Paytm. Prepay some expenses for next year. Dabble with some manufactured spending. If all else fails, refundable-hotel-trick that bad boy. That’s right, no minimum spending of any kind is required. By simply buying a pack of gum and keeping the card open for four months, you’ll receive a total of 105,000 HSBC Rewards points, which is again worth at the very least $525 in travel credits. Once you throw in the $149 annual fee, the minimum net benefit of the Quebec offer comes to $376, which is still a staggeringly high signup offer for a fixed-points rewards card. Comparing the two offers, we essentially see that Quebecers have to pay the first-year annual fee in exchange for receiving the full signup bonus without a burdensome $10,000 minimum spending requirement. Conversely, non-Quebec residents must “work” for their signup bonus, but enjoy a fee waiver in return. Either way, no matter where in Canada you live, you should consider applying for the HSBC World Elite MasterCard before the end of the year. Whether you choose to cash out the points for $525 or convert them to airline frequent flyer partners (as we’ll discuss below), the hefty signup bonus will go a long way towards helping you save on the cost of travel for the holiday season and into 2019. HSBC Rewards is a fixed points travel program, which means that in general each point has a fixed value when used towards a certain type of redemption (rather than being subject to an award chart like Aeroplan or Avios). The “baseline” redemption option that you should keep in mind is that 200 HSBC Rewards points = $1 in travel credit. Using the total signup bonus of 105,000 HSBC Rewards points, then, you can obtain $525 in “free” travel by charging your purchases to the card and redeeming points to offset the cost. You can also redeem your points for gift cards and merchandise, but similar to most points programs out there, the value in doing so is generally quite poor. Now, most banks in Canada have their own in-house rewards program, and I tend to think of them as being separated in to “good guys” and “bad guys”. The “good guys”, like Scotia Rewards, allow you to redeem your points for any travel purchase – airlines, hotels, car rentals, trains, ferries, cruises, vacations, etc. – that you charge to the card. You simply have 60 days from the day the charge posts on your statement to redeem the points. That gives you so much flexibility by allowing you to choose exactly when and how you want to spend your points. Meanwhile, the “bad guys”, like BMO Rewards and CIBC Aventura, force you to book travel through their own dedicated travel agencies if you want to redeem your points. Often times these travel agencies charge marked-up prices compared to what you’d find on your own, which further devalues your hard-earned points. You also can’t use your points for things like train tickets, budget airlines, or Airbnbs as a result, since the travel agencies don’t have the capacity to book stuff outside of their own proprietary back-end. Thankfully, HSBC Rewards is one of the “good guys”. You can charge any travel purchase to the card and redeem your points for it within 60 days. That also means that you can start booking travel that you intend to offset with points before you even receive the full signup bonus of 105,000 HSBC Rewards points – in fact, non-Quebec residents can even have those purchases count towards their $10,000 minimum spending! As far as I know, you do need to convert the points in chunks of 25,000 HSBC Rewards points at a time. If we consider the best-case signup bonus of 105,000 HSBC Rewards points, then that’d equate to 32,000 Asia Miles, 36,000 Singapore KrisFlyer miles, or 40,000 Avios, with 5,000 HSBC Rewards points left over. From there, the possibilities for redeeming your points are endless. Indeed, let’s say you were deciding between cashing out 100,000 HSBC Rewards points for $500 in travel credits or for 40,000 Avios. If you went for the latter option, you could redeem the Avios for up to nine short-haul one-way flights, a roundtrip between North America and Europe in economy class, a roundtrip between the West Coast and Hawaii in economy class (with a healthy balance left over), or a one-way in business class between Montreal and Dublin. All of those would easily exceed the alternative of $500 in terms of the value that you get! One last thing to consider is that HSBC Rewards represent one of the few ways to earn Singapore KrisFlyer miles here in Canada – indeed, you effectively have an earn rate of 2.16 KrisFlyer miles per dollar spent on travel purchases and 1.08 Singapore KrisFlyer miles per dollar spent on general purchases. If you want to save up enough KrisFlyer miles to try out Singapore Airlines's incredible business class, First Class, or Suites Class, then heavy spending on the HSBC World Elite is one potential way to get there. We haven’t even talked about one of the most valuable benefits of the HSBC World Elite MasterCard yet: the card has no foreign transaction fees, meaning that all purchases denominated in foreign currencies are converted at the MasterCard rate, which is virtually identical to the true mid-market rate. Ever since Chase exited the Canadian market early this year, we’ve been aching for good no-FX credit card options, and the HSBC World Elite is a great choice for that purpose. Pair the card with the Stack Prepaid MasterCard for your foreign cash withdrawal needs, and you’re pretty much set for all your spending when travelling abroad. The card also offers a $100 “Travel Enhancement Credit”, which can be redeemed towards the cost of ancillary airline fees such as seat selection or checked baggage. It’s interesting to note that several US-issued Amex cards also have a similar benefit – they’re meant to used towards ancillary fees and can’t be used towards airfare itself, although you can “cash out” the credit by buying airline gift cards of a certain dollar amount. I’ll be curious to put that to the test for the HSBC World Elite MasterCard as well and see if the $100 credit can be liquidated in a similar fashion. In addition, the card comes with complimentary MasterCard LoungeKey membership, although you do have to pay a US$27 fee per lounge visit, so it’s not as good of a lounge access benefit as other premium cards out there. You also have unlimited wifi at Boingo hotspots around the world, which can come in handy at a moment’s notice while you’re out and about. Lastly, the 31-day emergency medical insurance is worth pointing out – most premium travel credit cards only offer coverage for 15 days, so this is a great insurance option to have if you’re the type of traveller who takes more extended trips. HSBC advertises this card as “What a Travel Card Should Be”, and I’d tend to agree with them. The highly compelling signup bonus is of course the star attraction, and depending on where you live in Canada, you either get an annual fee waiver or a minimum spending waiver. But the card’s other perks and features are outstanding as well, with the 0% foreign transaction fees, the 31-day emergency medical insurance, and the simplicity of the HSBC Rewards program being my picks of the bunch. Make no mistake about it – applying for this card before the end of the year will position you well for a fantastic year of travel in 2019.